In a large pot, sauté onion in 1 Tbs olive oil until brown. Add pepper and allow to soften. Stir in whole tomatoes, whole garlic, and bay leaf. Turn down heat and simmer for 10 minutes. 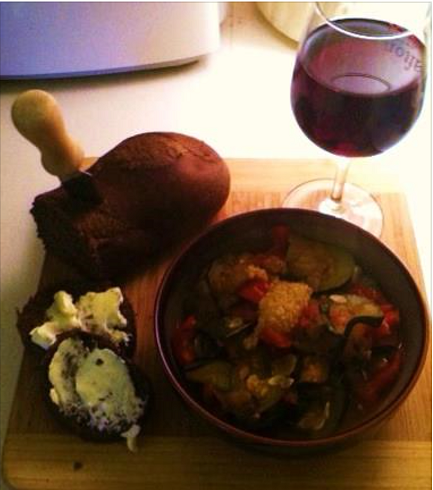 In a separate skillet, brown eggplant and zucchini until brown. Add to simmering pot with thyme and salt/pepper to taste. Simmer at least 25 minutes. Fish out the bay leaf and whole garlic. Serve hot, add minced garlic on top of each service. Great with French bread, brown bread and red wine. Having a hard time peeling your farm fresh eggs? You’re not alone. The issue is that they are FRESH. Store bought eggs are mostly…. old. As eggs age, the membrane starts to loosen from the shell. As an egg ages it gets lighter by evaporation of water through the porous shell, causing the growth of the air space. Hence the old water test for freshness, a fresh egg sinks and an old egg floats. So you have three options to hard boil your egg: 1. Buy old eggs from the store. 2. Buy fresh eggs and leave them in your refrigerator for three weeks, or 3. Take steps to make your egg separate easily from the shell. There are countless ways described on the internet to peel a farm-fresh egg. I’ve tried most of them. Everything from poking tiny holes with a tack at the bottom of the egg, but not too deep as to puncture the membrane (very, very, hard to do), to adding baking soda to the water (that one didn’t work at all), to cracking the shell all over right after boiling (this just made the shell stick in smaller pieces). Some people swear by these methods – but they didn’t work for me. A simple way that works is to boil the eggs for 13 – 15 minutes, drain the water and place ice over them for 10 minutes (or until all the ice melts). Peel immediately in cool running water to rinse the egg shells away as you peel. Start by cracking the egg at the big end as the air usually pockets there. The second most frequently asked question I get about boiled eggs is the yolk color. Yolk color in eggs will vary greatly based on what the chicken has been eating. Right after we give the hens beets, for instance, we see dark orange to sometimes red in the eggs. Since this tends to freak people out, we limit the chicken’s beet consumption. Sometimes, however, the yolk will be perfectly normal if you crack them, but will have a greenish-grey film after it has been boiled. This is caused by a chemical reaction in the egg. This film forms when the temperature of the yolk exceeds 158° F. This discoloration is not harmful. Sulfur from amino acids in the egg white is reacting with iron from the yolk in the heat causing a film to form on the yolk's surface. Don’t give up on your farm fresh eggs. You really can have delicious eggs, served boiled. 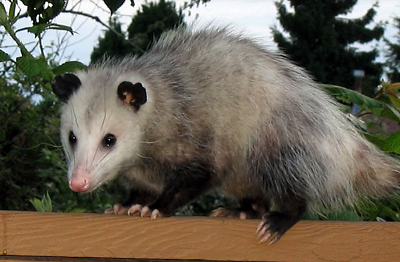 Anyone that knows our family, knows that I battle possums at the farm on a regular basis -- and here we go again. Last night, I came home from my day job to enjoy the “peace” of farm life. I started my routine by collecting the eggs. I open the nest box lid and there sits a freakin possum in my “predator proof” chicken coop; an egg held in his creepy little hands! I screamed. He screamed. I slammed the lid shut. I collect my nerves and peer in again. Where are my chickens? Possums eat chickens! Did he eat my chickens? Where is my rooster? The mean son-of-a-[gun] attacks me every morning. Why isn’t he attacking the possum? Do I look more menacing than the possum?? Nothing makes you want to dig in the dirt like a nice warm spring day. And, since spring is here I’m getting a lot of questions from folks who want to raise backyard ORGANIC vegetables. The first step is to obtain organic seeds or plants from a reputable supplier. Organic seeds or plants just mean they come from a certified organic grower that has not exposed them to any chemicals throughout the growth in the field, the harvesting of the seed, or the processing. That sounds great except that some of those chemicals actually prevent fungus, disease or pests so organic vegetables can be harder to grow, requiring more diligence to plant in optimal conditions and be on guard for early signs of disease or bug infestation. Your organic responsibility doesn’t stop at the seed. The next step is to grow your organic seedling by the standards set forth by the USDA's National Organic Program, which prohibits the use of synthetic fertilizers and pesticides, genetically engineered seeds and materials, sewage sludge (bio-solids), etc. 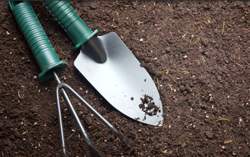 Since chemicals and metals from bio-solids can live in soil for a long period of time, unless you’re sure of what is in your soil you should consider purchasing organic soil to plant. As you can imagine this can quickly become ridiculously costly so use your best judgment about how far you’re willing to take your organic commitment based on the size of your garden plot and what you want to grow. Sometimes, a compromise of obtaining organic seeds and doing your best to abstain from chemical fertilizers and pesticides is the most economical approach – either way, you will have a tastier veggie, fresh-off-the-vine, than what you can find in your supermarket. Now – go dig in the dirt! I've been buying Motrosa Farm eggs for more than a year, and I can't go back to store-bought! The bright, vibrant color and superior flavor is worth every penny. I have yet to figure out how she grows such large vegetables; definitely worth every penny. There is no egg that compares to Motrosa Farm eggs - they are consistently bright in color - rich in flavor and you will never want any other egg once you try your first one! The horses eat every morsel of hay. Motrosa quality can't be beat!